I spent hours trying to find exceptional jewelry on estsy. Oh, there's loads for 20-somethings in Lululemon, and masses of chunky, lumpy beads. Lots of "repurposed" pieces that should never have been purposed to begin with. The strong point of many necklaces is their romantic name. After hundreds of page views, I bookmarked two vendors. I could admire their designs on a 50+ women without thinking her daughter bought her something she wanted. amieplan te makes naturalistic pieces that have just enough detail to enchant, but never overwhelm. The Black Rose earrings, $180 are shown in oxidized silver and pink pearl. Also available in polished silver and white pearl, and various custom options. She will also make them as dangles. Her Eucalyptus Le af ring with pearl, $95, is available in three color options: black patinated silver with white pearl (pictured), matte silver with black pearl, or copper/multicolor patinated silver with pink pearl. The graceful Rococo pendant comes in a variety of finishes and stones, shown here in with matte silver and carnelian, $140. I especially like her ability to offer various finishes and gem options, so if you're looking for something to coordinate with your silver, she can advise and send additional photos. After hundreds of pages of austere studs and earnest bead work, I was transported by the funky offerings of FIGistanbul, a Turkish vendor whose amped-up tribal goods stood out amid a sea of sweetness. 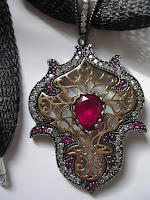 The 2-inch high Svetlana pendant, oxidized sterling silver with goldwash, red quartz and tiny clear and pink zirconias really kicks up its heels for $48, da? Comes on a 20" (50cm) flexible titanium ribbon or hang it on your chain. 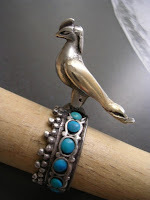 An Uzbek silver and turquoise Bird ring, $100, reminds me of something left behind when the gypsy caravan moves on. An original gift, or just the thing to add interest to your bangles or chains. Pastille earrings: a 3 1/4 inch (carnelian, pearl and turquoise give a 3 1/4-inch sweep of glamour for $75. Give them to anyone who will enjoy having her neck kissed. Both artists offer strong pieces that flatter women and sidestep, no sidedance, that earnest crafty look. Have an Etsy jewelry find you'd like to share? Tell us! These are just beautiful, Duchesse. Etsy is so huge and unwieldy that I give up after a while. Thanks for your labor, which, I hope, was a labor of love. I especially like the turkish pieces, Duchesse. I will visit that website to look more closely. You have far more patience than I do in searching the internets for treasure. I've tried looking through the etsy site stuff, but there is a whole lot of crap out there (have you checked out the blog called regretsy?) You have now shown me the error of my ways, I think I just fell in love with that bird ring. I´m thanking you for doing a huge job. Etsy and Ebay are far too huge for me to even think about visiting by. So great you found at least something pleasing. You do know how I feel about silver. I like some silver objects and I treasure the silver book mark , the one that belonged to my grandmother. Frugal; Did it while the family watched the Olympics! Alienne: Etsy was a sort of challenge- thanks! cybill: I like it too, it's quirky. metscan: To me, design and workmanship in jewelery are more important than that it be made of the most precious metals. Gorgeous choices. I also find etsy to be overwhelming. But on recommendations from Sal at Already Pretty and one of my commenters, I recently bought an orange and white agage cubes necklaces from this seller (danaleblancdesigns) who offers some nice pieces in natural materials (some more "vibrant" than my taste, but some pieces are just enough to add a kick). I usually just browse the vintage section of Etsy, as it's typically there that I find more unique-looking pieces that are also within my price range. Duchesse: I don´t believe that Etsy´s ideology is about the most precious metals. A personal design and naturally good handicraft is important. I also want to know the history or story behind the piece of jewelry, before I make my decision to buy something or not. Metscan: "You know how I feel about silver" is the part of your comment to which i was replying. Any one of these could make it worth my acquiring a PayPal account! You must have done so much work to find these treasures -- thank you! Both appear to be good choices that bear further scrutiny. Of course, you know I've got so much silver locally I really don't have to look on the net. Although that is part of the fun! Ebay has a better search function imo; however, bidding can be a major frustration. Etsy is way too confusing. I have found some lovely glass jewellery on etsy http://www.etsy.com/shop/photoglassworks the trick with etsy is to do a more specific search. 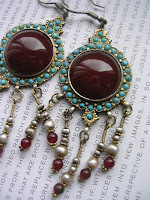 I loved the bottom pair of earrings..Looked vintage Victorian and at such a good price. I am not on etsy but I am a 50+ jewelry designer and I design for myself and my friends...women who want uniqueness and style and for the most part one of a kind pieces...I welcome you to visit my blog Beatnheart and its companion blog Beatnheat Boutique...Thanks for all your interesting posts...Its hard for us women to look cool, elegant and yet edgy...Everything is made for the young...not anymore!! 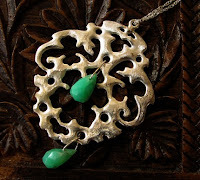 Beatenheart: Readers who enjoy interesting antique and repro pieces will definitely want to bookmark your site, thanks so much for pointing us there! I agree that the key w/Etsy is to do a really targeted search. Use as many specific "tags" (identifying words) that you think apply....the smart sellers know that that's how you get to them! There is some good stuff on Etsy, but boy do you have to sort through a lot of chaff to find it. I often get sucked into the vortex for hours and hours -- thank goodness there are "favorites" so I can find my way back to the crafters whose work I like! Pseu: Dana leBlanc works with some attractive material; I wish she knotted the beads rather than using spacers. Jean S. I use tags and also the feature that specifies a price range- especially useful for gifts. Rubiatona: If you are willing, would you share some of your favourites? rubiatonta: Thanks so much! I like moiraklime too and will enjoy exploring the others. Love those earrings at the end! I love the pendants, but for some reason I don't wear them. thanks for the tip - I'll go visit the Turkish site. Dear Duchesse, Thank you for the sweet comment and shout out for me. You are very kind and I appreciate it. Thank you for this post! I'm dying for a chunky, arty piece and have found a lot of not so impressive things on Etsy - and a few treasures too. Searching well is the key, indeed (I am not the type to embrace one mediocre pendant on a metal ring - I want craftsmanship and taste too).